Heraflux is proud to announce that David Klee is presenting a session in this year’s VMworld Europe #vBrownBag TechTalk lineup entitled “Performance Perspectives“. Currently it is scheduled for Tuesday, October 18th, at 2:30 PM local time. The 15-minute session will discuss how the perspective on performance and resource consumption from the VM-layer is not the only perspective that should be weighed when evaluating large, mission-critical app VMs. 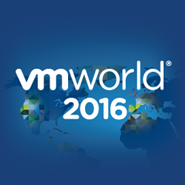 Come check out this and the other sessions near the Hang Space at VMworld Europe!